Finally! Our fourth and final volume of the Wisdom of Communities series has been released! 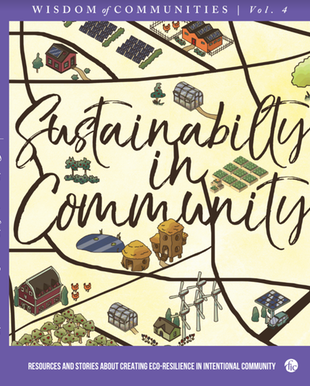 Now you can get your own copy of Volume 4: Sustainability in Community or order the entire set in both printed books and digital ebooks. Wisdom of Communities compiles hundreds of our favorite articles from Communities magazine and distills them into 4 hefty books, serving you a platter of the greatest wisdom our authors can offer on starting, finding, communicating and sustaining in community. This series is an essential set for community founders, seekers, current communitarians, students, and researchers alike. 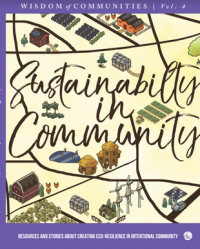 In Volume 4: Sustainability in Community we focus on food, water , shelter, energy, land, permaculture, ecovillage design, eco-education, and resilience in cooperative culture. These areas will prove more and more essential in allowing communities to navigate changing circumstances on our planet, while growing into new, regenerative ways of living and thriving together. For example, Gwendolyn Hallsmith lists in her article titled “Ecovillage Infrastructure: The Skeleton of Community,” the questions anyone must ask first who desires to build an Ecovillage. 1. What is your water supply and how will it be appropriately treated? 2. How will you address human waste and what are your area’s requirements? 3. What is your area’s zoning laws for housing capacities? 4. What type of legal entity will your community adopt (i.e. corporation, nonprofit, cooperative, etc)? 5. How will you establish home ownership? Through a land trust, cooperatively owned housing, subdivision or condominium? Read further details about each of these questions in the full article found in Wisdom of Communities: Volume 4 – Sustainability in Community. You can also view the introduction and entire table of contents here. What else is new in the FIC Bookstore? Visit our Recently Added page for all the books, documentaries and games you may have missed.